1972 was the last date that a fragment of the castle remained clearly visible above ground to all passers-by, although for entirely understandable reasons, very few probably appreciated its significance. 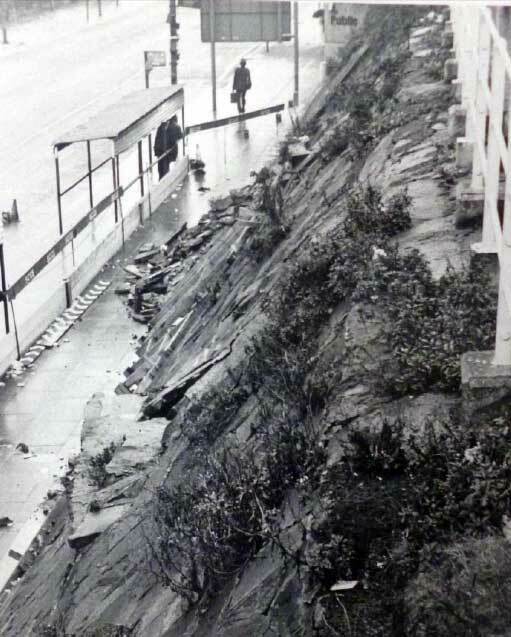 It can be seen in the lower left of this image, projecting from the collapsing crazy paving lining the slope above the bus shelters on the south side of Castlegate. I recollect quite a furore in the Sheffield press about the loss of this masonry.The late J Edward Vickers had a real go at the City Council who responded by saying that no one was certain that the material was from the castle. Only just realised Sheffield had a castle thanks to this website ! This castle was one of the biggest in England in the middle ages,maybe ‘Time Team’ should be invited ? In reference to Alan’s post above, unfortunately Time Team was canned a couple of years ago. Also, due to the sad passing of Professor Mick Aston, one of the leading lights of the programme both behind and in front of the camera, its return seems unlikely. With regard to the photo, it is most interesting to see this, my Father (a local resident since his teens in the mid 1950’s) always said he remembered seeing the remnants of masonry projecting from this banking. This photo, coupled with the aerial photo’s from the 1930’s, and the depth of the moat excavations serve to illustrate the elevation and strength of the natural defences. The moat itself being a man made extension of this natural strength. Most of the reconstructions seem to illustrate the castle as sitting almost at river level, with the moat functioning primarily as a water defence. In light of excavated and photographic evidence, i would be inclined to see the site as appearing much more elevated from the sides bounded by rivers, and the accessible side separated from the approach by a chasm like rock cut moat or ditch. Apologies again for going rather off topic!